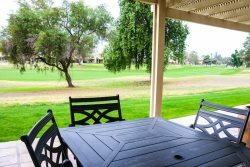 Vacation rental homes located in private country clubs featuring golf course and tennis club communities. *** Special ***Grab a glass of wine and enjoy the Lake Views! Fabulous Kitchen on the 1st Fairway! Lake Views...Close to Pool...Perfect Location! Beautiful Upgrades and Plenty of Sunshine! Greenbelt..Close to Pool...Huge Patio and more! Super Spacious! Bring the whole family! Steps to the Pool and Plenty of Room for All! Lake Views and Plenty of Room for All..
Lake View and Extended Patio! Pool in the Front...Greenbelt Views! All the Comforts of Home on the 2nd Fairway! Golfers Delight Right on 11th Green!